Alvareon - In The Making! : Double jeopardy for Indian in 2012! 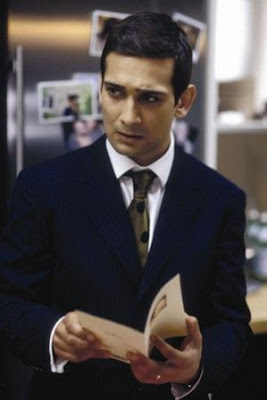 It’s a great feel to see Jimi Mistry play a crucial link in determining the survival of human race. But what’s truly disheartening is the fate that befalls him. At the outset of the movie, Dr. Satnam Tsurutani (Jimi Mistry) and his team in India painstakingly discover that a high concentration of neutrinos from the largest solar flares is triggering the earth’s temperature to rise and predicts it will set out a series of catastrophic ripple effects throughout the globe. American geologist Adrian Helmsley after a meeting with Satnam informs White House Chief of staff Carl Anheuser and the US President Thomas Wilson warning them about the possible repercussions of the findings. The finding makes it possible for starting the secret project of building series of arks within the Himalayan peaks so as to ensure continuity of human race. Very little is shown of the great Indian doctor then on as the movie proceeds, until in the end when Doctor Satnam makes a last phone call to Adrian to warn him about a 1500 meter high tsunami heading in the direction of the arks which is about to hit the mainland where he and his family are in. Can you call it a selfless act not fight for his survival and his family’s? May be. Was it his call to stay back? No. Was he ditched? Absolutely. Many didn’t make it to those arks which were the only way to survive. That apart, its sheer monstrosity to deny Jimi Mistry a pass to the ark. The brain behind the catastrophic prediction was in fact left to die. Hegemony in the world is so obviously portrayed in the movie? That's karma, Indian's tyrst with his cursed destiny! Absolutely heartbreaking!